What were your top online marketing news stories this week? I’ll be back in two weeks with more digital marketing news! The lovely and talented Ashley Zeckman will be filling my spot on camera and on the blog next week with the latest and greatest in the world of digital marketing. The post Online Marketing News: Critical Personalization, Social Strategy Research & Marketers on Reddit appeared first on Online Marketing Blog – TopRank®. 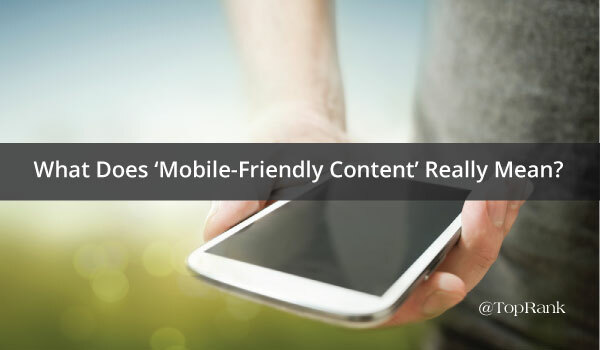 What Does ‘Mobile-Friendly Content’ Really Mean? If you’re a 90’s kid, you likely have fond memories of Saved by the Bell and its star, precocious Ferris Bueller type Zack Morris. You could tell Zack was unique among the students at Bayside High. For one thing, he could stop time and address the camera directly. But more importantly, he had a cellular phone. Sure, it was the size (and probably weight) of a brick. But it wasn’t connected to a landline! That big rubberized antenna didn’t connect with a corded receiver nearby-it pulled connectivity out of thin air. Magical. Fast forward to today, and kids who were born after Saved by the Bell went off the air are now entering the workforce. 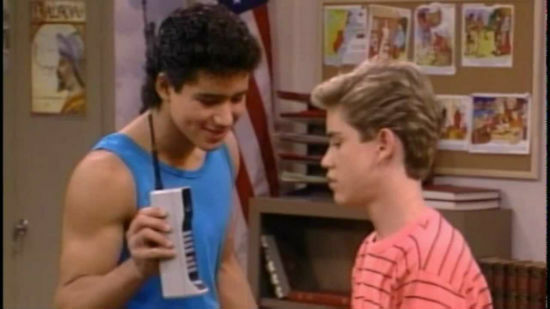 If they met Zack Morris, they would probably make fun of his hair, his clothes, and his giant phone. Mobile phones aren’t reserved for cool kids with time-stopping powers anymore. Whether we’re old, young, or middle-aged and trapped in a nostalgia loop, smartphones are our constant companions. It’s high time for marketers to catch up with this reality. Over a year ago-an eternity in Internet time-Google announced that more searches take place on mobile devices than on computers. That fact has led Google to include mobile friendliness as part of its ranking algorithm. They know more people are on mobile than ever before. And they are invested in providing a better experience for mobile users. Being on Google’s good side isn’t the only advantage to being mobile friendly, though. The only reason Google prioritizes mobile friendliness is that it’s what users want. That is, it’s what your audience wants. So, how is your mobile experience? Sure, you already have responsive design, but is your content actually optimized for people to consume it on a mobile device? Or is reading your site more like trying to catch Pokémon on Zack Morris’ phone? Here’s how to make different types of content more mobile-friendly. Video is the rising star of mobile content. Thirty-five percent of viewers watched more video last year than they did the previous year. And 36% said they watched videos that last five minutes or longer every day. Use a service that automatically optimizes the tech stuff. Don’t fiddle with bitrates and compression on your own. Go third-party with YouTube or Vimeo for a seamless user experience. If you want to host your own video, use Apple’s HTTP Live Streaming. It can adjust the video quality on the fly to match bandwidth capability, just like Netflix does. Make sure text is readable. Mobile screens are small. Even the big ones are small. Don’t make your viewer squint to see the fine print. Make it make sense without audio. Eighty-five percent of video on Facebook is played without sound. And even if your viewer has their headphones in, odds are they’re in an environment that makes listening difficult. Try watching the video on mute to make sure it still gets your points across. Create images in a pre-optimized format. Use a tool like Canva to create images the right size and resolution for social media and email. Use smart compression. You can compress .jpg files a bit without compromising their appearance. But too much compression leads to ugliness. Tinyjpg is a neat tool that compresses by reducing the color depth in ways invisible to the human eye. It’s downright spooky. Use a tool for responsive resizing. If you have web development wizards on your side, they can help with responsive resizing from the server side. If you have to go it alone, a service like ly Display can do the heavy lifting. Serve content in snack-friendly chunks. Think short sentences and short paragraphs, broken up by visual assets, video, embedded content from Vine, Instagram, or Snapchat, or at least white space. Use headers for navigation. Make sure readers can skim the post and get a good idea of what you’re talking about. Think of the headers as the “trailer” to entice people to take in the whole post. Include the main points in your conclusion. If your article starts to look like a time commitment, mobile readers might just swipe to the bottom and see how it wraps up. Make sure the relevant points and call to action are waiting for them. Regardless of where they encounter your content, you want your audience to have a positive experience reading or watching it. So make sure your brand is putting its best face forward for the 50% who will encounter you first on mobile. Give them responsive video content that makes sense even if their headphones are off. Make sure your images look great, display properly, and load quickly. And make sure your text is snackable, navigable, and skimmable. What are your top tips for creating mobile-friendly content? What did I miss? Let me know in the comments. The post What Does ‘Mobile-Friendly Content’ Really Mean? appeared first on Online Marketing Blog – TopRank®. Testing different variations is one of the quickest ways to learn, and Digital Advertising is no exception. When you begin talking about A/B testing, many of us get nervous and all sorts of possible catastrophes begin swimming around in our heads. But the truth is, advertising is a quickly evolving tactic, and in order to gain momentum, testing has become a necessity. Whether your advertising is social, display, native or search, the key to better results and return on investment is testing. To help you navigate the sometimes-confusing world of digital advertising testing, we’ve provided some helpful resources below. An A/B split needs to be shown to the exact same audience, during the same times of day, same days of the week and in the same areas in order for you to have a firm grasp on which variation is truly performing better. It’s important to have a firm grasp on your data set or audience so that you can split the information and create an equitable ad deliver. You’ll find that most platforms have options for testing including, Google AdWords, Analytics Experiments, Optimizely and Unbounce. In order to measure success, you need to make sure you’re giving you tests enough time to run. We typically recommend running tests at a minimum of 2 weeks with most tests running for 1 month. How much data is required for you to have statistically significant results? If your program sees low volumes (clicks, impressions, conversions), you need to run longer tests. If you have a high volume account you can call tests much faster. If you have drastic peaks and lows due to seasonality, I suggest finding the middle ground for testing. I never recommend testing during a seasonal low unless you dealing with a high volume account. Make sure that both groups have equal coverage during your peak days and weeks. Again, try to avoid running tests during your low periods, especially if you see significant swings in CTR and conv. rates. It’s also essential to make sure that your test is going to have impact. Sometimes slight copy variations and image changes aren’t going to tell you much. You want to make sure the variant has a very clear goal and hypothesis. For example, by changing a button from “Download” to “Get My Guide”, I’m hoping to see a 10% lift in conversions. What Types of Digital Advertising A/B Tests Should You Try? Changing a single word within your message normally doesn’t lead to strong insights so make sure there is substantial change. Below you’ll find a couple of examples where we have tested different messaging tactics for significant engagement improvements. Testing different elements on your landing pages can lead to surprising results. Whether it’s the layout, form fields or buttons, it’s always important to experiment. Below you’ll see a simple button label change driving a major improvement in lead volume! For social posts, display channel and landing pages, it is always good to test a couple of contrasting images, themes and concepts. Especially if you have multiple audience personas, you’ll want to know what type of visuals and graphics resonate best with your audience. Do you need to be straighter forward, does humor resonate with your audience, and does your audience like to see the product? Are certain concepts better for social than display? You’ll discover these answers via testing. 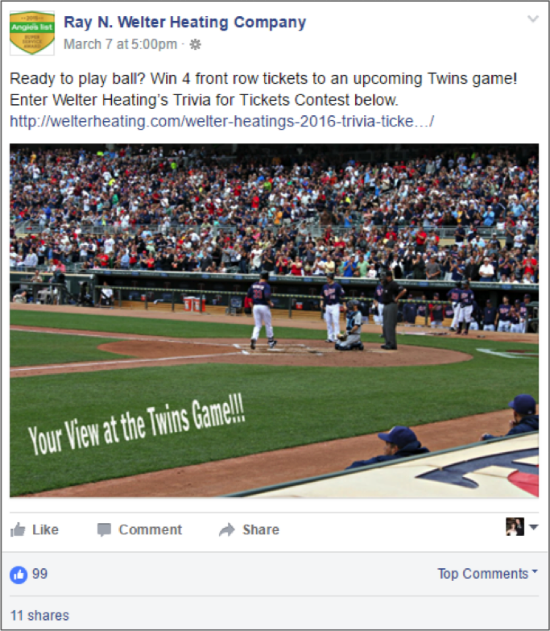 Here’s an example of a test we ran for a social campaign. #FuranceFail had a humorous twist that resonated much better with our social audience. Again, make sure you’re testing has purpose, a hypothesis and a goal. If you’ve put serious thought into your A/B tests you won’t be disappointed. While the outcome may not have been desired, now you know and knowledge is power. 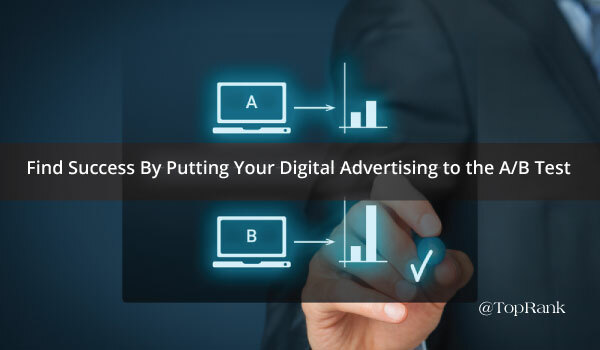 The post Find Success By Putting Your Digital Advertising to the A/B Test appeared first on Online Marketing Blog – TopRank®. When it comes to effectively and meaningfully reaching your audience, I think it’s pretty safe to say that all marketers understand the important role social media plays in that quest. Not only does your audience seem to live on social networks-posting vacation selfies and checking into newly opened restaurants-but they also rely on them for information, entertainment and engagement. First of all, you’re competing hard for your audience’s attention. I mean, everyone is on social media these days. According to the Content Marketing Institute and MarketProfs 2016 Benchmarks, Budgets and Trends-North America reports, 90% of B2C and 93% of B2B marketers say that social media is the most used content marketing tactic, outside of blogs. In addition, you may not have a social strategy in place or are working with limited resources, which can hinder your ability to maintain a consistent social presence. But the good news is that there’s several things you can do to give engagement a nice little boost. And the great news is that anyone can do them-and that’s why we’re calling them hacks. There are a number of tools-both free and for a fee-out there. Some of those include: Hootsuite, Tweetdeck, Sprinklr, Spredfast and Buffer. Choose the one that best matches with your budget, goals and the networks you’re using. 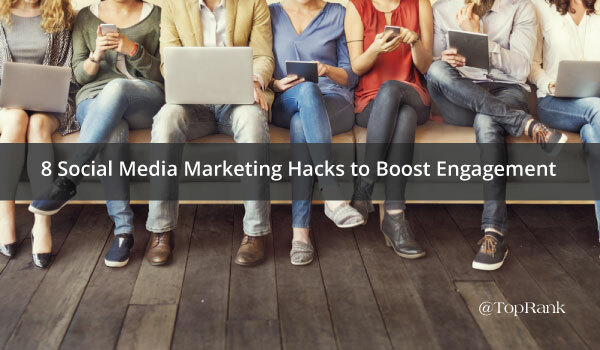 The post 8 Social Media Marketing Hacks to Boost Engagement appeared first on Online Marketing Blog – TopRank®. In the case of Visa, our traffic on Visa.com is very high-millions upon millions of visits a year-but visitors are on a fact-finding mission that can be a misfire, since they’re often hunting for cards and we don’t issue cards. My remit is to take those visitors and serve them so well that they have a reason to return. Rebecca Lieb and I joke that we are each other’s conference wives because even though she is in NYC and I’m in SF, we see each other more on the road at content marketing conferences than we do at either of our homes. And I miss Michael Brenner-I haven’t seen him since he launched Marketing Insider Group. So thank you Joe for the family reunion! I can’t imagine text could die. It doesn’t make sense. We are a distracted bunch. In what universe are we going to give up the act of reading one thing while sitting in public and listening to something else-a presentation, a discussion, a conference? Even when I bump into a story that comes from a TV news station or NPR, I always scroll down to read the article. I watch a lot of videos and I listen to a number of podcasts, but these are situational behaviors. Be sure to watch for the next in our series of CMWorld keynote speaker interviews coming next week! 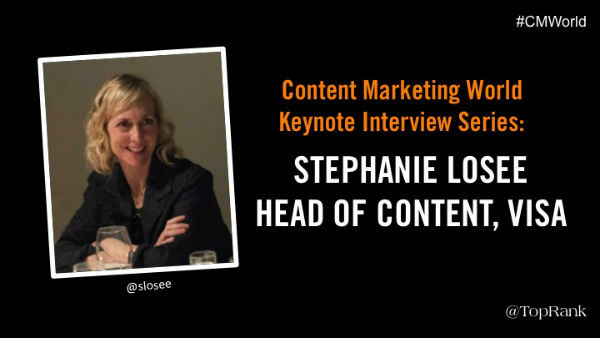 The post Content Marketing World Keynote Interview: Stephanie Losee, Visa appeared first on Online Marketing Blog – TopRank®. CMO Survey: Which Emerging Technology Will Transform the Customer Experience? I’ll be back next week with more online marketing news! If you have something to share, send your thoughts in the comments or Tweet me @Tiffani_Allen or @toprank! 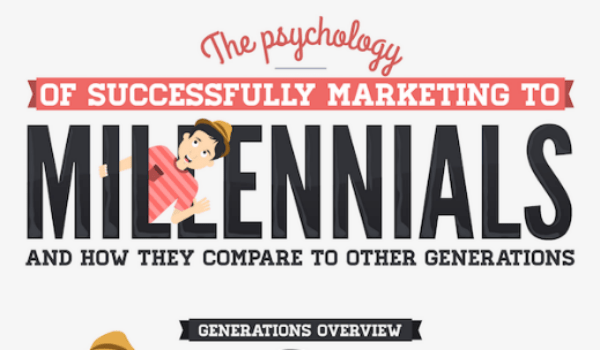 The post Online Marketing News: Millennial Psychology, Influencer Misconceptions & SEO Issues appeared first on Online Marketing Blog – TopRank®. Reaching and connecting with customers in a meaningful way has become incredibly challenging. There I said it. It’s no wonder with the sheer number of flash-in-the-pan marketing practices have somehow made their way into brands large and small only to leave marketing teams throwing their hands up in frustration. The amount of knowledge and data that we have access to today really is incredibly. Unfortunately, it can be hard to filter out the sage advice from that which is better left undiscovered. It wasn’t so long ago that everyone started saying: “brands need to be on social!”, so companies jumped at the chance and signed up for every social platform available (even those that didn’t make sense). 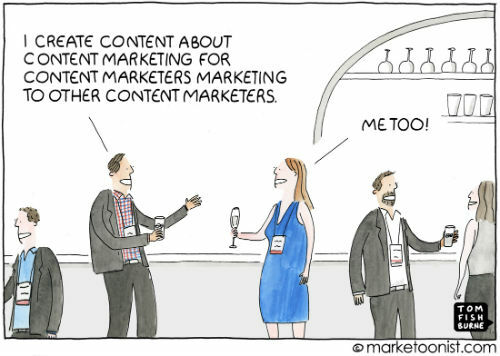 Then, when people said: “we need content!”, it led to a huge boost in the amount of content created and even today 76% of marketers plan to create more content this year than the year before. 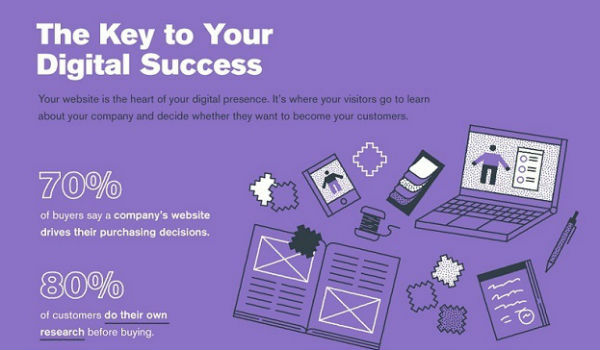 While it can be tempting to jump at the opportunity dig your teeth into every new tactics because well, everyone else is doing it, it’s important to take a step back and consider whether it is the right fit for your customers, for your brand and for your message. Influencer marketing is no exception. When implemented correctly, a content driven influencer marketing program help accomplish everything from building awareness to developing trust with current and potential customers. If any of the following pains sound like what you’re experiencing, then chances are influencer marketing might be a welcome addition to your marketing strategy. Most marketers today are being tasked to do more with less. The hefty ad and marketing budgets aren’t what they used to be (even at larger companies). In addition to having less to spend, marketers have been tasked with amping up the creativity and improving results. Instead of feeling frustrated with smaller staff and budgets, the current state of affairs presents an opportunity for marketers to get creative. Co-creating content with influencers enables brands to align with like-minded individuals and extend their reach significantly. Do keep in mind that depending on your industry or the type of influencers you’re working with, there may be some cost associated with partnering. However, partnering with influencers has to potential to reap rewards that far outweigh the cost of other marketing initiatives. If you’re like most marketers, your team spends countless hours poring over data to identify the content that is resonating best with your target audience. You may notice that you have some breakout content, but in all, your audience doesn’t seem to be very engaged with the message. If it doesn’t catch their attention they don’t read it. If they don’t read it then they’re definitely not sharing it. By incorporating a combination of curated and original content from influencers into long and short-form content, you’re able to add signals of credibility and up the “Interesting factor” of what might otherwise be a dull article, eBook or white paper. Adding influencers that can empathize with your customers will help them see themselves in your content and create a stronger connection with your brand. Let’s face it, who does? When you feel like a company’s only interest is in getting you to buy their product or service, it’s a turn off. And as we know, all of the research clearly states that people buy from people that they feel like they know and can trust. If your goal is to create value for your customers (as it should be), then the inclusion of influencers into your content can help build authority, credibility and trust which can in-turn lead to sales. If you collaborate with top tier influencers then those people are essentially endorsing your brand as one that is credible and trustworthy. Influencers are a powerful tool and when incorporated appropriately, they allow brands to focus on adding value for customers all while encouraging more engagement. 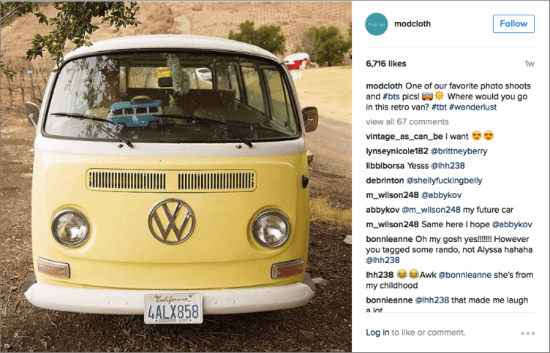 Could Influencers & Content Be a Winning Combination for You? Influencer content programs aren’t a magic bullet or replacement for an integrated digital marketing strategy. However, knowing when and where to add influencers to your content mix can be an incredibly effective way of providing value for customers and potential customers. We’d love to hear what some of your content challenges have been and help you determine if adding influencers might help! 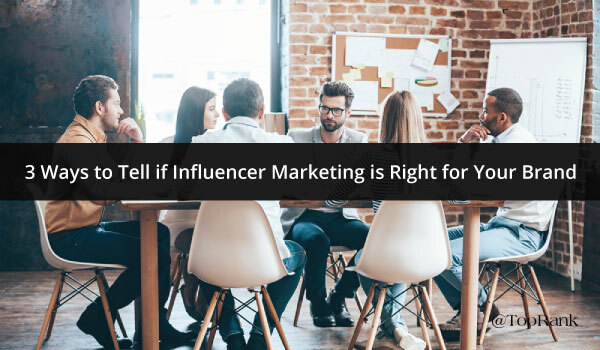 The post Should You or Shouldn’t You: 3 Ways to Tell if Influencer Marketing is Right for Your Brand appeared first on Online Marketing Blog – TopRank®. How much time out of your life do you sacrifice to your commute? It’s amazing how quickly it adds up. If you drive/bike/bus just 30 minutes each way, that’s five hours a week. Do that 50 weeks out of the year, and it’s 250 hours, more than six full work weeks. Yeesh. Now, I don’t mean to bum you out. Just pointing out an opportunity. Most of us spend hours a week trapped in one form of conveyance or another. Why not use that time to continue your marketing education with a good podcast? For those not in the know, podcasts are recorded shows (usually audio only, though some have a video component) posted on the Internet to stream or download. Think of it like an audio blog. You can usually tune in on the show’s website, or subscribe on a service like iTunes, Google Music, or Stitcher. I recommend the latter option-the apps can put all your subscriptions in one place, and remember what episode you’re on and where you left off. Most importantly, they put the whole shebang on your phone, where you can listen via Bluetooth, headphones, or Bluetooth headphones. Topics Covered: Mostly social media marketing, with a little general digital marketing thrown in. Social Media Examiner has established itself as an amazing resource for all things social. Their blog posts are always intensely tactical, useful how-to guides for whatever topic they’re tackling. I’m pleased to report the podcast is a worthy extension of the brand. Every Friday, host Michael Stelzner takes on a new topic, always with an expert guest to lend a hand. Topics Covered: Interviews with authors of marketing books. If you’re looking for marketing books to read, or for an expanded take on the ones you’ve already been through, this podcast has you covered. Host Douglas Burdett interviews a new marketing book author each episode. You get an inside view of the author’s process and their take on marketing, and frequently get recommendations for additional reading material, too. SPOS (as it’s called) is hosted by Mirum’s Mitch Joel. Joel was an early adopter in the podcast game; they’re up to 523 weekly episodes and counting. Mitch and his guests cover hot marketing topics, pick an app of the week, and even include some recommended music for you to enjoy. “PNR” stands for Joe Pulizzi and Robert Rose, the brain trust behind the Content Marketing Institute. These guys have a decade of experience with content marketing, and they’re both learned scholars about the tactic’s historical roots. What’s more, they’re both entertaining performers with great chemistry together. And they answer listener questions! What’s not to like? Each of the 400+ episodes of the BeanCast is a lively, irreverent roundtable discussion with a different panel every time. Host Bob Knorpp keeps things light and keeps the conversation moving. If you can handle the occasional bit of crude humor, the BeanCast is a great way to stay up-to-date on marketing news while laughing your face off. The original rock ‘n’ roll marketer Jason Miller of LinkedIn Marketing hosts this year-old podcast, drawing on a deep bench of talented marketers for insightful interviews. Jason knows how to have fun and keep things light, but never fails to elicit serious insights from his guests. Right now it looks like they’re on a bit of a hiatus while Jason settles into his new role at LinkedIn UK, but there are plenty of back episodes to keep you going until he returns. Like the Sophisticated Marketer’s Podcast, this one features industry veterans-in this case, Jay Baer and Salesforce’s Adam Brown-who have a hefty rolodex of smart marketers to tap as guests. If your role involves social media at all, this is a must-listen. This daily podcast is unique: It’s short, and it doesn’t feature noteworthy guests or lively discussion. Instead, the team at Growth Hacker TV picks one article from the blogosphere every day and summarizes it in a quick but thorough way. It’s perfect for those fortunate enough to work from home-you can listen on the way from your bed to your office. Hosts Mark Schaefer and Tom Webster describe their show as “The World’s Most Entertaining Marketing Podcast.” I’ll leave that to the listener to judge. But there’s no denying Mark and Tom put on a good show. They’re funny, they’re insightful, and at 30 minutes an episode they always leave you wanting more. Copyblogger’s Sonia Simone has industry cred to share. She’s put in her time and she knows her stuff. On this podcast, she alternates solid how-to episodes with thought leader interviews. All of Rainmaker.fm‘s podcasts are excellently produced and eminently worth your time, but this one is my personal favorite on the platform. Topics Covered: The invisible forces that shape our thoughts and interactions with the world and each other. Sample Guests: A blind man who can ride a bike, a woman who can feel other people’s pain. It’s important for marketers to be aware of the wider world outside our bubble. For that purpose, I recommend Invisibilia. Hosts LuLu Miller, Alix Spiegel, and Hanna Rosin explore the invisible ways society, the environment, and our own bodies affect our decisions. It’s a podcast that will challenge what you know about influence, free will, and much more. It may not be a marketing podcast, per se, but it’s great for forcing your brain out of well-established ruts. These are my picks for podcasts to make you a better marketer on your morning commute. What did I miss? Let me know in the comments. Disclosure: LinkedIn Marketing is a TopRank Marketing client. 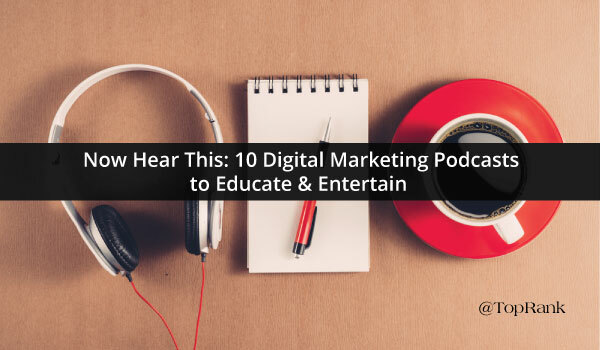 The post Now Hear This: 10 Digital Marketing Podcasts to Educate and Entertain appeared first on Online Marketing Blog – TopRank®. These days, it’s pretty safe to say that all marketers understand that video is an increasingly important marketing tool for capturing audience attention, showing value and encouraging engagement across the digital universe. In fact, 87% of online marketers use video content, according to an infographic from Hyperfine Media. However, when it comes to promoting that video content on social media, marketers often ask users to click a link to a website, blog or another outside platform to watch, rather than just giving them the content outright. But as social media platforms improve their video shooting, editing and uploading capabilities, many brands and marketers are going native with their video content. When looking at it in the context of social media, native video is any video content that is created in or directly uploaded to a social media platform, which then auto-plays with the news feed. Native video is perhaps most recognizable on Facebook, Twitter and Instagram. Why should your brand consider native video? How do you get started? Below I aim to answer those questions and more, as well as provide you with some insights for incorporating native video and examples of native video in action. #1 – Native video boosts engagement. Successful social media marketing requires creating a connection with your audience by providing them with content that educates, entertains, and encourages interaction and engagement. Since native video content lives on your social media page, you’re eliminating a barrier to that interaction and keeping people engaged with your brand in that very moment-rather than sending them to another space. In addition, if your native video content hits the right spot, it will inspire shares and expand your reach beyond your current following. #2 – Native video has a leg up on third-party embeds. At least when it comes to native video on Facebook, the social media platform’s algorithm seems to favor native over embedded video content. 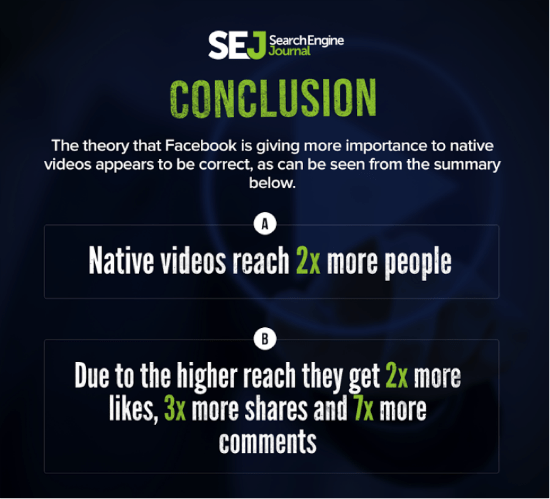 Last year, Search Engine Journal took a look at native video content versus YouTube content on Facebook and found that native content reaches two times more people-and, as mentioned above, native video content receives way more engagement. #3 – Native video can help further the brand-customer relationship. When you give your audience compelling native video content-with no strings attached and no extra clicks needed for them to enjoy-you’re showing users that you’re not just looking for a sale, but to give them something of value. This approach can help build brand awareness and trust that is the foundation for the brand-customer relationship. Earlier this year, TopRank Marketing partnered with DivvyHQ to create the Easy-as-Pie Guide to Content Planning eBook, which featured three recipes for improving content planning and effectiveness. As part of the project, we created a motion graphic video to tease all the great stuff in the eBook. The video was uploaded to YouTube and web content, but was uploaded it natively to Facebook. For TopRank Marketing’s Facebook channel, we saw a almost 2000% more views for the native video than the one that was uploaded to YouTube. Tasty videos have become a staple in many Facebook feeds and cause many users to stop, watch, drool and save the recipes to make later. What makes these videos so compelling is the fact that they do their job without relying on sound. When a video auto-plays in a news feed, they’re usually muted until you click on the video. Below is one of Tasty’s latest Facebook posts. Check out the engagement data on it! FamilySearch is the world’s largest genealogy organization, providing family history lovers with the ability to preserve and discover their family’s past. They boast huge followings on their social networks not only because they provide a quality service, but they also work to engage their audience-and native video is a part of their strategy. Here’s an example of a recent Twitter post promoting their efforts to get 72,000 people to index and save world history records in just 72 hours. In addition, a motion graphic video posted natively to their Facebook page has nearly 11,000 views, 476 likes and 165 shares after being posted about a month ago. Great Big Story is a CNN-funded startup that produces original videos on off-beat topics that aim to engage young audiences. A recent blog post by NewsWhip dove into the company’s native video strategy, featuring insights from Great Big Story’s Director of Audience Intelligence Khalil Jetha. One key part of their strategy is customizing the experience for each of its channels-Facebook, Vimeo, YouTube and their own website. Below is one of their most recent native Facebook posts. When I found it, it was just two hours old and already had nearly 460,000 views. #1 – Use your text wisely. While native videos will auto-play in the news feed, you’ll need to add a little flavor and context to what you’re showing people in the post itself. Be creative and compelling, and try to keep it short and sweet. 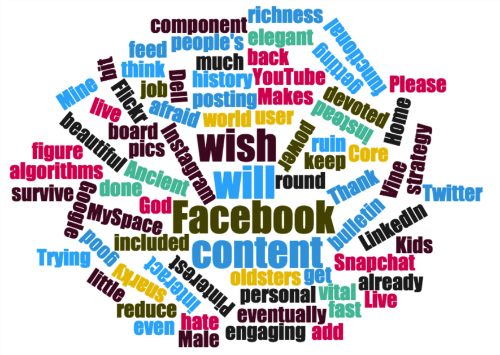 #2 – Customize content for your audience. In NewsWhip’s article, Jetha stresses the need to understand your audience and the platform you’re using. Figuring out out who your audience is, and why they’re interacting with you on that platform is more important than creating one unified brand strategy across every single social network,” he said. “When I say that, I mean that you can’t expect to repurpose one piece of content the exact same way and put it up on different networks. #3 – Create something that speaks for itself. As I mentioned in my comments about Tasty’s native video posts, in most cases sound doesn’t happen unless the video is clicked on. Work to create something that doesn’t need sound to give it meaning and understanding. #4 – Experiment with live video options. Twitter’s Periscope and Facebook Live, as well as Instagram, provide brands with the opportunity to give their audiences native video content that’s a little more raw and authentic. This kind of video content can be great for giving your followers a sneak peek of a new product or special event you’re attending. #5 – Make native video a part of of your overall social media (digital marketing) strategy. Tossing up a native video every now and then won’t give you the results you’re looking for. Use your audience personas and data you’ve collected for each social media platform and decide where native video would make sense. Then work it into your overall strategy like you would any other piece of content. #6 – Don’t force it. It’s true that users are hungry for video content, but that doesn’t mean you need to burn your current strategy to the ground and rebuild it with native video. Whether or not native video is right for your brand is ultimately going to depend on who your audience is and what resonates with them, as well as what your overall marketing and business objectives are. Are you using native video as a social media marketing tactic? What have your results been? Tell us in the comments section below. Disclosure: FamilySearch was a TopRank Marketing client at the time this campaign was launched. 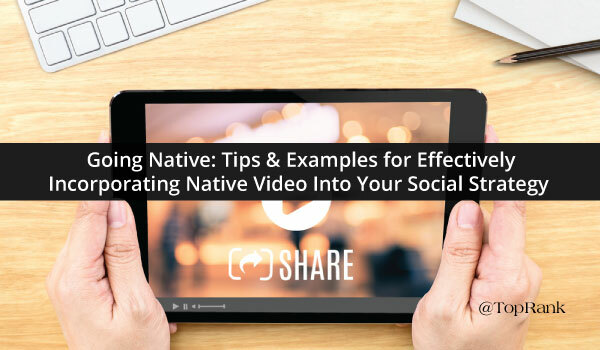 The post Going Native: Tips & Examples for Effectively Incorporating Native Video Into Your Social Strategy appeared first on Online Marketing Blog – TopRank®. Marketers who are far smarter than I am have talked a lot about “content shock.” The idea is that content creators keep churning out more and more content, but readers have the same limited time and attention to consume it. It’s simple supply and demand: Supply increases, demand stays the same, and content gets devalued. It’s definitely true that there is more content out there than ever before. And over 75% of B2B and B2C marketers plan to create more this year than they did last year. So the amount of content will only increase over time. The question, though, is whether the rules of supply and demand apply to all content equally. To answer that question, let’s look at a similar problem facing a different industry: mobile gaming. There are thousands of free-to-play mobile games on the market. There are dozens more being added every day. There are already far more than anyone could play in a single lifetime. As with marketing content, each game is competing for the same limited amount of audience attention. In an environment that crowded, it seems like no one in their right mind would sink massive amounts of resources into a new game. What could such a game really be worth to a business in 2016? If you’re Nintendo, the answer is $7.5 billion. That’s the value added to the company’s stock after one week of Pokémon Go. Hundreds of thousands of people are playing it. News organizations can’t stop talking about it. It’s a genuine runaway hit. Nintendo came into the crowded market and made its own space. It turns out that the law of supply and demand doesn’t apply universally for mobile games. And the same is true for content. 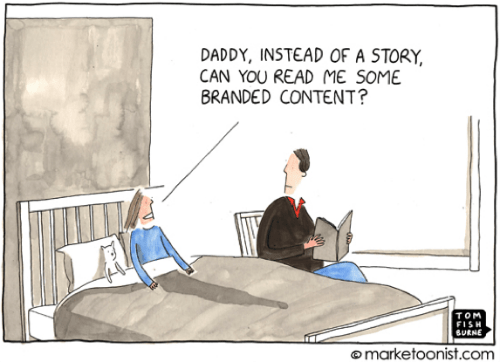 There is no demand for content, because that would imply content is a commodity. You can say there is a rise or fall in demand for something like, say, soybeans. One bean is pretty much identical to another. You either want them or you don’t. When we say supply far outstrips demand for content, that statement only applies to content created and treated like a commodity. Soybean content. Featureless. Interchangeable. Bland. Of questionable purpose. Think of it this way: If we are truly at peak content, why are people still using search engines? There’s more content out there than people can read in a lifetime. There’s no room for new content. So why are people still looking? The problem isn’t that we’re somehow supplying too much of what our audience demands. They’re not satiated. They’re not gorged on so much useful content that they couldn’t eat another bite. We’re not allowed to shrug our shoulders and give up on creating content. We need to find out what our audience actually needs and address it. We need to create content that has its own built-in demand. Create content that inspires and affects your audience’s life beyond just their interaction with your product. Content that takes a stand, that seeks to make the world a better place. My go-to example for inspirational content is the Always: Like a Girl campaign. Its message is individual and societal, relevant to the products they sell, but completely devoid of sales-y content. It always makes me tear up a little. Yes, there is demand for bottom-of-funnel content, just not as much for the other categories. So it’s important to create content for it; just don’t make it your only focus. To avoid adding to the vast warehouses of soybean content out there, find out what ways your audience is asking for help. It’s true there is a glut of content out there. So it’s important to listen to what your audience demands, create accordingly, and promote strategically. That’s the only way to get beat the economics of content supply and demand-produce the kind of content that can’t be measured in bulk. 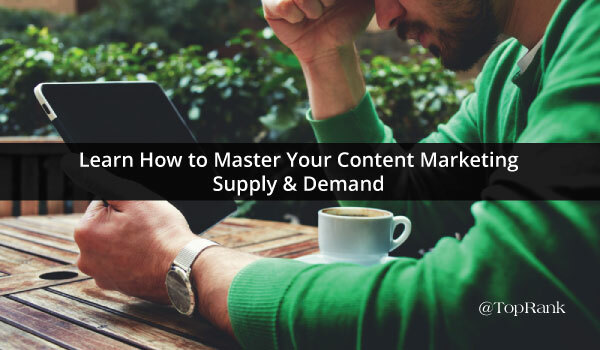 The post Learn How to Master Your Content Marketing Supply & Demand appeared first on Online Marketing Blog – TopRank®.